Now Is A Great Time To Change Your Life With A Beautiful, Confident Smile! Call Us Today For Your Complimentary New Patient Exam! The entire Flores Orthodontics Team loves to change our patients' lives for the better. Our role in our patients' lives is an important one, as we enhance their health and appearance, and thus, enrich their lives and sense of well being. We are always welcoming new patients and we would love to have you as part of our orthodontic family. We are conveniently located in Escondido and Fallbrook to serve the communities of North San Diego County with excellent and personalized orthodontic care. We provide all types of orthodontic treatment from Invisalign clear aligners and clear/tooth colored braces to metal braces and retainers. We treat patients of all ages: children, adolescents, and adults, from age 5 and older. We invite you to explore our web site and learn more about us. You will find information about our doctor, team, offices, and services. If you have any questions please call or email us. We love hearing from our patients and anyone who may be interested in becoming one! We Will Provide You With A Beautiful Winning Smile! 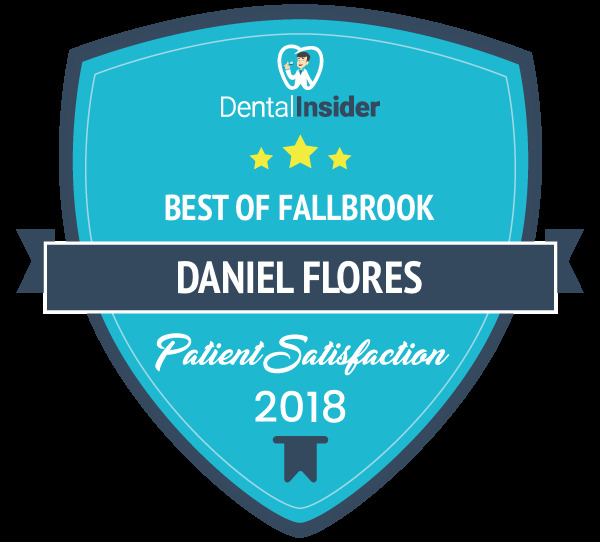 Daniel Flores's Practice has been recognized as one of the top Fallbrook Dentistry practices.